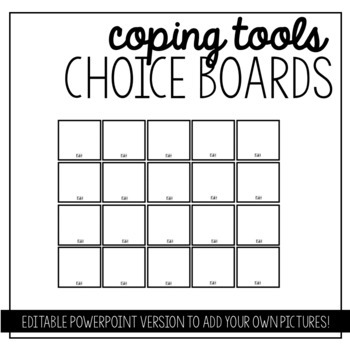 Coping Tools Choice Board - EDITABLE! Coping skills are effective ways that we manage our emotions and stay regulated throughout the day. We all use them! 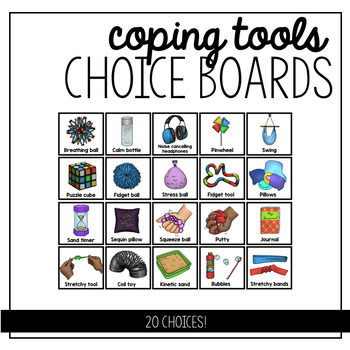 Having specific tools at hand to help our students find regulation and calm are research based - why not add a choice board to the mix so students can have ownership over their emotional regulation? 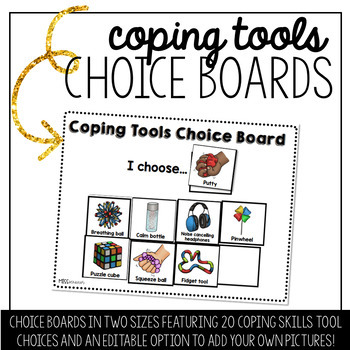 This product includes choice boards in 2 sizes and 20 full color picture choices for students to add to their choice boards as regulation options. There is also an editable PowerPoint document that allows you to add your own pictures and descriptions for choice board options! Check out a blog post to see more about this product.